This is a salad to celebrate summer: fresh herbs, ripe tomatoes, crisp cucumbers and fruity olive oil. These, combined with the heartiness of a toasty grain and the protein of spiced chickpeas, make for a delicious, refreshing, and filling summer meal. I can’t remember exactly when I first discovered freekah, but I know that it’s been a favourite grain of mine ever since. More nutritious than quinoa, more delicious than bulgur, with a versatility that makes this foodie very happy, freekah has a permanent (and frequently used) place in my kitchen. 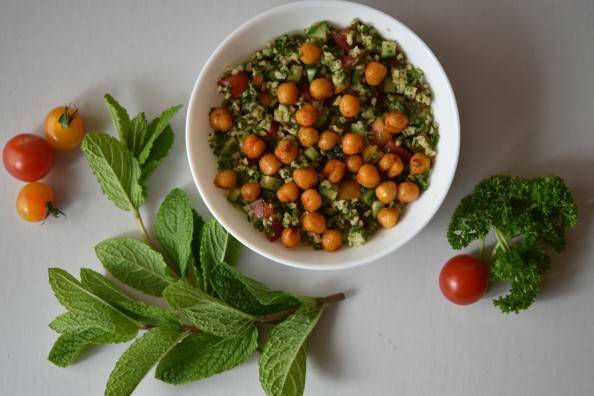 I use it mostly in pilafs and grain salads, with this Freekah Tabbouleh being my favourite (at least in the summer). I love having a big bowl of this on a sweltering day – it’s filling without being heavy, and flavourful enough to perk up the most jaded hot-weather appetite. This makes a large amount, to eat over several days, or to take to a party. If you don’t like leftovers for days on end, make a smaller batch. The recipes divides easily. Freekah is green wheat, steamed, dried and cracked. It has a nutty flavour and delicious texture. 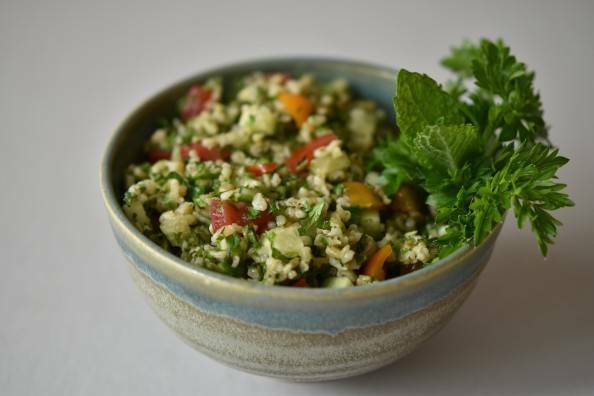 It makes an excellent substitute for bulgur in this fresh tabbouleh salad. Preheat oven to 425°F. Cover a baking sheet with parchment paper. Open the can of chickpeas; drain and rinse well. Drain well to get rid of as much excess water as possible. In a medium bowl, mix together the olive oil, salt, and harissa. Add the chickpeas and stir to coat the chickpeas evenly with the spice mixture. Spread out on parchment-lined tray. 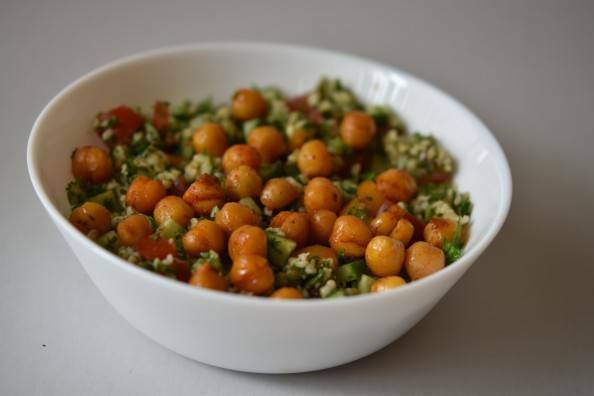 Place in the oven and roast for about 30 minutes, stirring several times, until chickpeas are slightly crispy. Remove from oven and let cool. In a small pot with a tight-fitting lid, combine the freekeh, water and salt. Bring to a boil, stir well, reduce heat to low, cover tightly, and cook 20 minutes. Keep covered, remove from heat, and let sit 10 to 15 minutes. Remove the lid and fluff with a fork. It should be put into the dressing while still warm (see below). While the freekeh is cooking, get everything else ready. In a large bowl, mix together the lemon juice, salt, garlic, and olive oil, until well-combined. Mince all the herbs, and chop the vegetables, but keep these separate for now. Once the freekeh has finished its 10 to 15 minute rest, and been fluffed, immediately pour it into the lemon juice mixture in the large bowl. Stir well to allow all the freekeh to be coated in, and absorb, the dressing. Set aside to cool, stirring several times. This will take about 20 minutes. 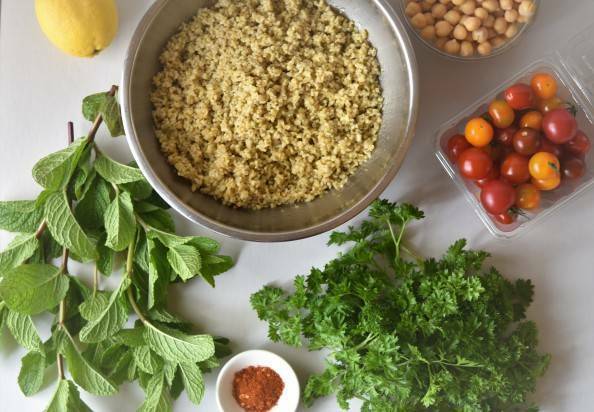 Once the freekeh is no longer hot, stir in the minced herbs and the chopped vegetables. 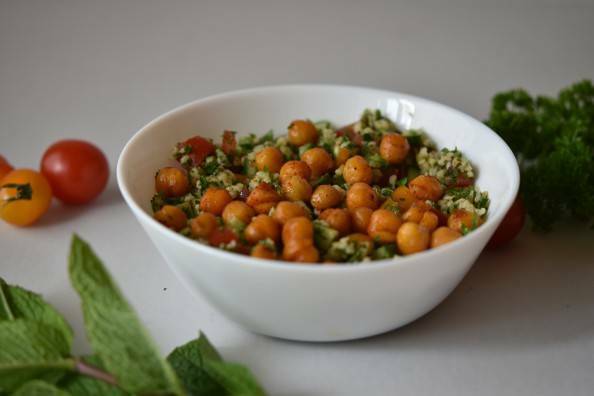 Transfer tabbouleh to serving dish, scatter the harissa-roasted chickpeas over the surface, and serve. Salad may be made up to 5 days in advance. Keep refrigerated. 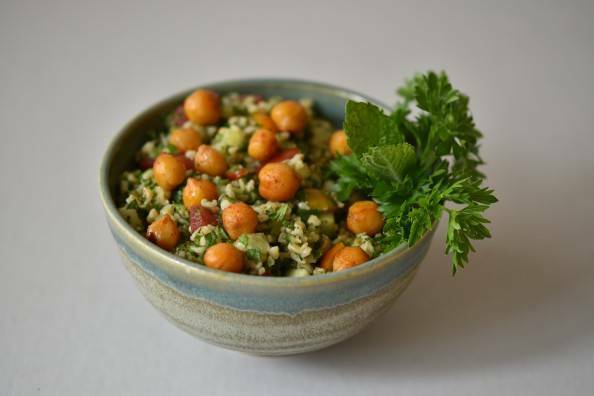 Reserve the chickpeas until just before serving, though, or they will lose their crispness.